See a live animation of how an artificial neural network is trained to represent a Gaussian-shaped function. The network has two-dimensional input (x, y), and one-dimensional output (z). 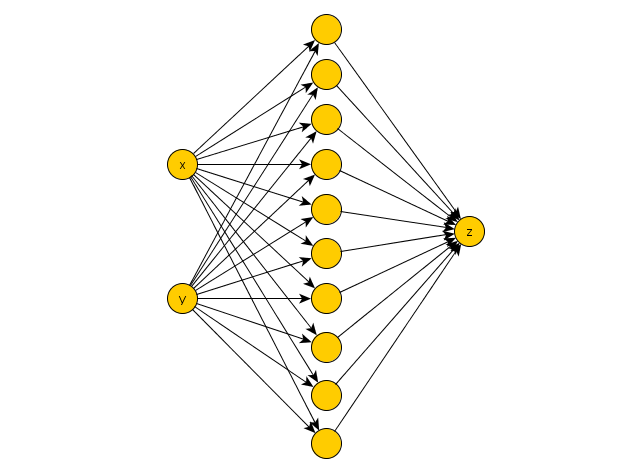 The hidden layer of the multi-layer feed-forward network has 10 hidden units. The training data for the network consists of 121 samples of a Gaussian-shaped function. The samples were taken on a regular 11×11 grid. Here is a video of three independent training runs.